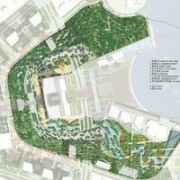 SWA wins competition for Suzhou Design center, a 26.5-hectare site with landmark design for city center. SWA Group won an invited design competition for Suzhou Center, a 26.5-hectare site located in Suzhou’s still-developing Central Business District, with office, hotel, residential buildings, retail corridors, transit, roof gardens, canals and waterfront parks adjacent to historic Jinji Lake. The landmark design, which is planned to break ground in April 2012, creates a signature city-center of urban offerings, greenspace and lakefront amenities along an approximately 2-km visual corridor reminiscent of the Washington Mall, Champs Elysees in Paris and other grand urban spines. A striking 88-story arched Gateway Tower, now under construction toward completion in late 2012, anchors the Suzhou Center development. Its arch shape encases the visual corridor connecting Old Town and the city’s other urban center, Suzhou Industrial Park (SIP) Central Business District. 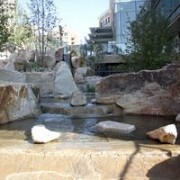 The City Creek Center project in downtown Salt Lake City under construction is slated to be completed in 2012. Located directly across from the Temple Square, the project occupies the site where the historic City Creek once traversed the land when the Mormons first settled the valley. The two-block project consists of five residential towers, six office towers and a two block 2 story retail component. The landscape takes the historic creek and surfaces it, featuring a half-mile long water that emerges at the north east corner of the project as a bubbling spring, building to form a mountain stream and leading to a grand cascade. The city block design supports urban living intermixed with pocket parks, roof gardens, and connective elements. Says Amirah: “I head across the Pacific Ocean with many questions I hope to answer: As China continues to grow, how can it accommodate both cars and bikes? What sort of highways, arterials and bike paths are needed to make sure people can efficiently and safely zoom to and from the many, many new buildings rising in this Asian superpower? What sort of infrastructure is needed — and how can it be smartly incorporated into landscape urbanism and landscape design to minimize harmful environmental impacts?” Read the entire blog here. SWA’s creates “Embrace” concept for the Rio Olympic Games Competition. 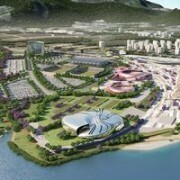 Out of 59 entrants in the Rio 2016 Olympic Park design competition, SWA’s design team placed second in the competition to design the 118-hectare site in the neighborhood of Barra da Tijuca. The underlying concept, “Embrace,” focused on design as a grand planning gesture to both define the Olympic Games and provides a lasting identity for the city of Rio de Janeiro. The Olympic infrastructure, designed for both the present and the future, creates an exuberant Games experience which easily adapts into a sustainable urban community woven together by public space: an innovative greenway system, restored wetland habitat, and urban park. What are urban ecologies? Andrew Watkins, Qiu Hong and Sean O’Malley investigate the intersection of ecology, landscape architecture and urban design. In Shunde New City, the designers take a look at the Pearl River Delta: designing for ecological preservation and restoring bird and wildlife corridors while also providing regional connectivity, transportation, and development options is at the pinnacle of today’s development challenges. In the Shunde New City Plan, urban development and nature are integrated to form a unique and comprehensive system beneficial to both people and the natural environment. The plan for Shunde is part of a larger initiative to look at the art of ecology, “an attempt to understand the pattern and beauty of the larger, comprehensive systems that are the underpinning of each of our cities and landscapes.” Andrew Watkins’ essay on the relationship between ecology and form investigates how design processes and ecology can form the inspiration in our future designs, while Sean O’Malley looks at the art of ecology and urbanism and how that plays into the designs shaping our recent projects. To read the series of articles, check out Advocacy: Urban Ecologies. John Wong, Managing Principal of the Sausalito office will be speaking at the CTBUH World Conference 2011 (Council on Tall Buildings and Urban Habitat) on October 10th. The conference is in Seoul, Korea. John’s presentation, “Humanity: Entering the Clouds,” is a look at the design of ground planes and high rise buildings, part of the Urban Environment and Pedestrian Experience track for the conference. CTBUH is a well-renowned global organization and it’s wonderful to have landscape architecture “at the table” for probably the first time. 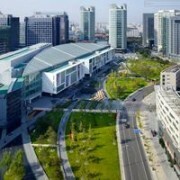 The 2011 Fall Meeting Urban Land Conference is in Los Angeles. Join us on Thursday, October 27th as SWA and Parson Brinckerhoff co-host a reception for business colleagues and guests. The reception will be held at Cork Bar in downtown Los Angeles following the conference events. On Friday, October 28th, we will be moderating two design panels: Principal Marco Esposito will be moderating a panel discussion on universities as drivers of thriving communities and local access points to the global knowledge economy. President Gerdo Aquino, along with moderator Kirk Humphreys, will be the lead panelist for “From Eye Sore to ‘A Must See’: Creating Urban Parks from Thin Air and Adding Real Estate Value.” Join us as we look at the creation of value from within the urban landscape and across universities. 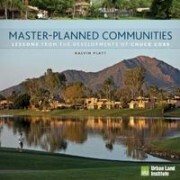 Kalvin Platt’s new book was published with the Urban Land Institute: Master Planned Communities: Lessons from the Developments of Chuck Cobb. With case studies of some of the most successful master-planned communities in the United States, Kalvin Platt shares design techniques and lessons learned from development over the last 50 years. Illustrated with 200 great Tom Fox photographs and detailed with drawings and maps, Master Planned Communities covers projects from the 1960’s onward and compares these built communities to the Smart Growth Principles that came 30 years later. The book details nine categories of lessons learned, both positive and shortcomings, for present day planners, designers, developers and local governments. 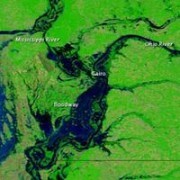 Recent flooding in the Mississippi River corridor prompted significant media coverage about flooding and protecting our cities and homes. Kevin Shanley, CEO, responds the press coverage with an alternative perspective: perhaps we are failing to understand the ecology of the river. “Our historic approach for developing the river’s floodplain has been defined by short term goals,” he writes for Metropolis Mag. “We’ve built levees so we can farm its rich fertile soils; but these levees now prevent the river from replenishing that very fertility. We moan about the farmers’ losses without considering the decades of gain the farmers have received from the fertile soil. 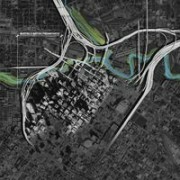 We’ve built small communities and large cities in this same floodplain because the river provided an important transportation corridor, yet we aren’t willing to spend the money to relocate or harden critical infrastructure.” Read his recent essay and check out the satellite imagery from the point of view post, on Metropolis Mag. What is Landscape Infrastructure? Our latest design briefing publication compares and contrasts traditional and landscape infrastructures, offering seven typologies of design to integrate landscape and ecological systems for greater efficiency and performance. Traditional city infrastructure generally incorporates transportation and communications systems, as well as water and power lines, and other utilities and structures. It often places a premium on through-put and efficiency. Landscape Infrastructure is a methodology that expands the performance parameters of a designed landscape to a multi-functional, high performance system, including those systems originally ascribed to traditional infrastructure. 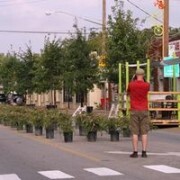 In September 2010, local landscape architects and community activists formed a collaborative to develop a plan for The Better Block Project, a one day urban block transformation project set in Dallas, Texas. A simple set of interventions was proposed that could be constructed and removed in the course of a single day. The final product combined a number of simple modifications to generate a big impact in the community’s overall enjoyment of the space. 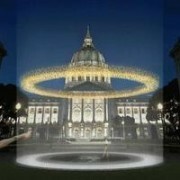 San Francisco’s Veteran’s Memorial –SWA named one of three finalists for the Veteran’s Memorial Competition. SWA and Norman Lee were named as one of three finalists to the San Francisco Veteran’s Memorial competition. Their entry, described as “startlingly different,” by the SF Gate, was “A Wreath of Remembrance.” The design proposed a wreath of military dog tags suspended above the ground by guide wires, a notion that represents eternity, continuity, and memory. The dog tags would be both visually stunning as well as auditory, producing a chiming sound at night. To read more about the competition and entries, check out the article on the SF Gate. 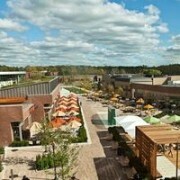 Rochester Institute of Technology Global Village is a new campus residential neighborhood for 2,000 students that includes a mixed-use plaza with retail, seminar, and study lounges. The strong pedestrian pattern with walks and courtyards extended the academic core and provides seamless links between existing campus housing, new construction, and beyond. The recent 2010-2011 completion of the $54 million project has “earned accolades,” with students gathering informally and occupying the well-lit, multi-use space throughout all times of the day. The vice president for student affairs described the space as “a great gathering place, the kind of common square you see in great cities.” To read the recent article about the Global Village, check out the Rochester Business Journal. 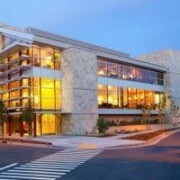 Hummingbird Place, Mission Estates, and the Palo Alto Medical Foundation win 2011 Gold Nugget Awards! Out of over 400 entries, the Palo Alto Medical Foundation won for an Office/Professional Building (Category 3), and Hummingbird Place and Mission Estates in Fremont, CA won for Infill / Redevelopment (Category 25 and 26). Cross Creek Ranch in Houston, is attracting community buyers and awards for its innovative landscaping, larger lots, and comprehensive amentities. 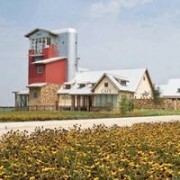 Native grasses, sustainable planting, and nearly 20,000 native trees and wildflowers are planted across the land. While the design required more collaboration, effort, and coordination up front, as Trendmaker noted in Builder Magazine, it was planned with a long-term vision in mind: water conservation and reduced maintenance will both prove to be long-term wins for sustainability. And the project is beautiful, too: it won the Landscape Design of the Year and Master Planned Community of the Year awards for the Greater Houston Builders Association. 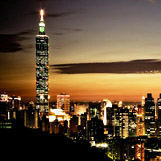 Bill Callaway talks to Mike Sheridan of Urban Land about knowing the market in China. Active for over three decades and with 100 projects in planning or under construction, Callaway says that SWA Group knows a bit about doing business in China and knowing what you’re working with. 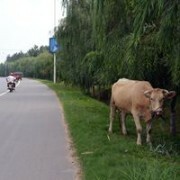 “Those projects range from Kunshan New City near Shanghai, where SWA is designing an entirely new riverfront district to accommodate growth in sync with environmental and sustainability objectives, to the 100-acre (40.5-ha) green spaces of Beijing Finance Street, the capital city’s first ‘central park,’ ” writes Sheridan. “China means big business, but companies need to understand how things work,” continues Callaway. “For instance, a shared passion for the project or its vision is critical. It is important to size up the client and decision-making process reasonably quickly, without short-circuiting the relationship-building process. Gauge the client’s level of experience in the area of business you are working in.” To read the full article from Urban Land online, check it out here.